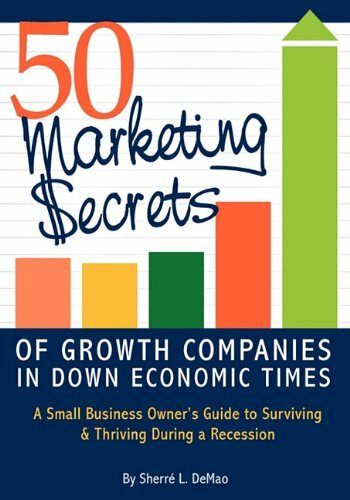 In Ms. DeMao’s extraordinary book, she gives tremendous insights into what marketing solutions companies are finding not only to survive, but thrive during the current economic downturn. She interviews owners from virtually every type of company and considers every type of marketing strategy from customer relations to referrals to making the most of the company’s Internet presence, to strategic involvements like collaborations and public relations. She doesn’t just give simple platitudes but goes into depth about how to do each of these things in a way business owners can put into practice immediately. She has more than 60 examples of working companies from Fortune 500 down to micro-businesses. My favorite part of this book is that she is not suggesting a business owner spend a fortune on advertising campaigns or other marketing efforts that are all cost and no investment. It is so easy to justify throwing money at problems but instead her entire approach is about strategy. She insists that the business owner think about what will work for that business. And as we all know, the innovation and intelligent investment of our small businesses is what will ultimately make the difference in bringing the American economy back to its resilient self. It is not surprising she was named among the most 50 Enterprising Women in North America and that her first book, Me, Myself & Inc. was named a Top Business Shelf pick by Midwest Book Review. Armchair Interviews says: This is a 5-start read. Buy this book, go to the park and just take notes of all of the things you can immediately implement in your business – and then get back to work!